신라 제44대 민애왕(838∼839)의 무덤으로 높이 3.8m, 지름 12.5m이다. 여러차례 도굴을 당하였으나 1984년 9월에 국립경주박물관에서 무덤과 주변을 발굴조사하여 규모를 밝히고, 현재의 모습으로 정비하였다. 조사결과에 의하면 무덤 밑부분 바깥쪽으로 일정한 간격의 12개의 구멍이 있었다. 구멍에는 곱돌로 만든 12마리 동물의 얼굴에 사람의 모습을 하고 있는 십이지신상을 하나씩 묻었다. 조사 당시에는 쥐·소·닭·돼지 4개만 발견되었다. 나머지는 무덤의 외부받침석이 만들어질 때 파손되고, 없어진 것으로 추정되었다. 무덤 주변에서 뼈단지가 발견되었는데, 뚜껑에 ‘원화십년(元和十年)’이란 글자가 있어 헌덕왕 7년(815)에 만들었음을 알 수 있다. 이 뼈단지는 무덤이 만들어진 후에 묻힌 것으로 무덤은 815년 이전에 만들어진 것으로 판단된다. 그러므로 839년에 죽은 민애왕과는 시기적으로 차이가 있다. 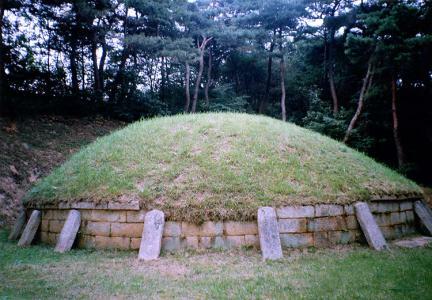 This is the tomb of King Minae, the 44th king of Silla who reigned from 838 to 839. The royal tomb, with height of 3.8m and width of 12.5m, had been robbed twice before the liberation in 1945. It was almost robbed again in 1981, but the residents found out just in time. 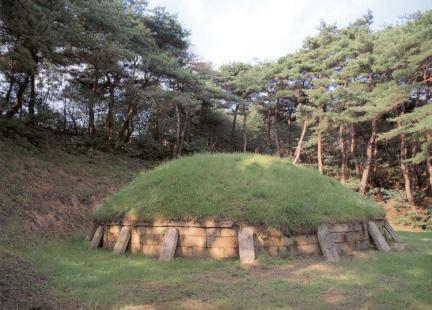 The attempted robbery prompted the Gyeongju National Museum to examine the interior and surroundings of the tomb in 1984 and improve its condition. The inspection revealed twelve holes placed on the exterior bottom of the tomb at a certain interval. The holes were for the images of the twelve zodiac animal deities in the human body, which are believed to guard the ground. There are only four images left: they are the mouse, the cow, the rooster, and the pig. The rest are assumed to have been destroyed and stolen when the outward stay was constructed. Another discovery from the inspection is a pottery of bones with the letter indicating the name of the Chinese era on the lid, which refers to the year 815. Since pottery for bones was buried after the tomb was constructed, the tomb is assumed to have been built before 815. Therefore, this tomb can hardly be claimed to be that of King Minae, who died in 839.